Marcel Utz is Professor of Magnetic Resonance and Head of the Magnetic Resonance Section within Chemistry at the University of Southampton. Marcel Utz obtained a Diploma in Materials Science in 1994 and Dr. Sc. Techn. degree in 1998 from the Swiss Federal Institute of Technology (ETH) Zürich, Switzerland, where he had worked under the guidance of Prof. U. W. Suter and Prof. R. R. Ernst. 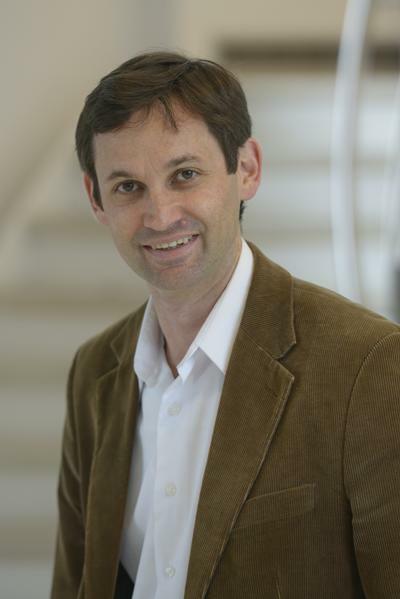 After a postdoc at the Department of Chemical Engineering at Princeton University, he joined the faculty of the Polymer Program and the Department of Physics at the University of Connecticut in 2000. In 2006, he moved to the University of Virginia as an associate professor of Mechanical and Aerospace Engineering. He joined the School of Chemistry at the University of Southampton in 2012. The Utz research group specializes in the science and engineering of multifunctional micro-systems, mainly in view of applications in the life sciences. Our major focus lies on integrating nuclear magnetic resonance (NMR) spectroscopy with microfluidic devices. We are also interested in structure-property relationships of micro-structured materials, as well as the design, fabrication, and operation of microfluidic networks. NMR spectroscopy is an extremely versatile and powerful tool, with widespread applications in organic chemistry, structural biology, medical diagnostics, and materials science. Our research aims to enable the observation of the metabolome of biological systems (live cells, cell extracts, or small organisms) in microfluidic lab-on-a-chip (LOC) devices by high-resolution NMR spectroscopy. Fabricated by lithographic methods similar to microelectronics, LOC devices allow the manipulation and analysis of complex biological systems on a compact, expendable platform. The integration of NMR spectroscopy with microfluidics poses a number of interesting technical and scientific challenges. This has produced a multi-disciplinary research environment in our research group, with work spanning many fields from radio frequency electronics and micro fabrication to physical chemistry and spectroscopy. Peng, Q., & Utz, M. (2011). Deformation dilatancy of molecular glasses. Pre-print. Ryan, H., Landers, J. P., Begley, M. R., & Utz, M. (2012). High-resolution NMR spectroscopy on a chip by structural compensation of magnetic susceptibility mismatch. Paper presented at 16th International Conference on Miniaturized Systems for Chemistry and Life Sciences, Japan. Xu, K., Utz, M., & Landers, J. P. (2011). Fluidic capacitor-based, self-contained and self-powered microfluidic chip. Paper presented at 15th International Conference on Miniaturized Systems for Chemistry and Life Sciences, Seattle, United States. Ryan, H., Song, S-H., Lamson, K., Elliot, J., Zaß, A., Wang, K., ... Utz, M. (2011). Metabolomic NMR on a chip via inductive coupling. Paper presented at The 15th International Conference on Miniaturized Systems for Chemsitry and Life Sciences, United States. Utz, M., & Begley, M. R. (2011). Microfluidic waveguides for frequency-based pumping. Paper presented at 15th International Conference on Miniaturized Systems for Chemistry and Life Sciences, Seattle, United States. Utz, M., & Prudnikova, K. P. (2010). Spatially resolved pressure and flowmetering in microfluidic systems using polyelectrolyte hydrogels. Paper presented at 14th International Conference on Miniaturized Systems for Chemistry and Life Sciences, Groningen, Netherlands. Huang, L., Seker, E., Utz, M., Begley, M. R., & Landers, J. P. (2008). Quantitative end-grafting of DNA onto flat and nanoporous gold surfaces. 1567-1569. 12th International Conference on Miniaturized Systems for Chemistry and Life Sciences, United States.